The all new Minikin 2 is a powerful advanced box mod powered by a GX-180-HT/UT chip which incorporates the same battery power saving capabilities as its predecessors but features a new wattage cap of 180 watts and touch screen support! 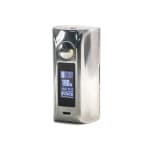 The easy to use touch screen interface of the Minikin 2 offers a variety of vaping modes, ranging from your standard viarable wattage, to the all new Curve mode, and typical advanced modes such as TCR and TFR. The Minikin 2 features a redesigned body that was designed to be exceptionally comfortable to hold. The asMODus logo has been re-positioned to the back of the device and the USB port has been moved the front of the device as the battery door has been remodeled to add magnetic closure. 15 vent holes have been added to the base of the device which allows for maximized heat dissipation. 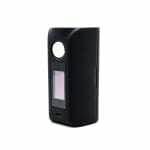 The Minikin 2 is powered by two 18650 batteries, not included. You can buy 18650 batteries here. Didn’t buy from this site - but definitely would if I was buying now, great customer service. Excellent product - this mod spoiled me because nothing matches up to this quality in my mind. Soft touch coating is nice on the hands and has held up 100% from the last year and a half of daily use. Chip is easy to use and navigate and has quick firing. Best in wattage mode. Ergonomics are amazing on hand, comfortable to hold. Great battery life. Only knock on it is the batteries on the door may pop off, but this is true of any mod. Luckily a little bit of krazy glue and you’re to go - mine cAme off after a fall recently.